Cracking your cell phone screen is the worst, right? Whether it happens after you’ve have one too many on a Saturday night or when your phone slides off your nightstand after you try to hit snooze for the 10th time on Monday morning, dealing with a cracked screen never gets any easier. So with that in mind, it’s hard to blame Cowboys running back Darren McFadden for resorting to extreme measures in order to save his iPhone over Memorial Day Weekend. According to reports, he very nearly dropped his phone while he was at home before he was able to fall and save it from breaking. 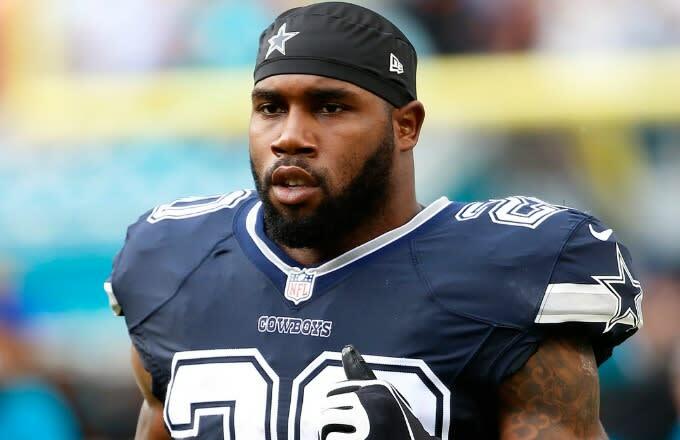 Darren McFadden had surgery on his fractured elbow this morning. Practiced all of last week with injury. X-ray revealed the break. Cowboys RBs coach Gary Brown said Darren McFadden received that "pre-CBA money" so he can afford another phone. Gary Brown on Darren McFadden&apos;s fall: "He was trying to keep his iPhone S, his brand new one from hitting the ground and cracked his elbow." Gary Brown asked if McFadden should have dropped the phone instead, "He&apos;s got that pre-CBA money, so I don&apos;t think he needs the phone." Ouch. On the bright side, McFadden won’t have to file an insurance claim for his iPhone. But between this and the $15 million lawsuit he filed against his former business partner in early June, he’s having a pretty crappy month.